What to watch: AOC and Markey are holding a press conference today and the full list of initial co-sponsors will also emerge, so it'll be interesting to see how many of the 2020 Democratic hopefuls currently in Congress choose to sign on. Axios previously learned that co-sponsors will include Sens. Cory Booker (D-N.J.) and Kirsten Gillibrand (D-N.Y.), who are both in the race. The Washington Post reports another 2 White House contenders, Sen. Kamala Harris (D-Calif.) and Sen. Elizabeth Warren (D-Mass. ), will also be co-sponsors. Several other candidates have broadly endorsed the concept of the GND. As WashPost's Jeff Stein points out on Twitter, the resolution's arrival means that White House hopefuls will now be asked about something more concrete. The intrigue: That phrasing seems to leave the door open to technologies that some activists oppose (such as fossil fuels with carbon capture and nuclear energy), but doesn't name-check any of them, though AOC's chief of staff has broadly said that the goal is a transition from fossil fuels. What they're not saying: The plan is silent on whether it would impose a carbon tax. Some GND advocates have said a tax could be part of the policy — but don't see it as a central pillar. What's next: The resolution is basically a political messaging document, so look for advocates to put more meat on its bones with legislation and papers in the coming months. Go deeper: Read the full story here and see NPR's post of the resolution text here. Axios' Alexi McCammond contributed to this reporting. Generate readers probably know that the Permian Basin in Texas and New Mexico is the epicenter of the U.S. shale boom. But that chart above — via the latest edition of the Dallas Fed's Energy Indicators report — really helps to tell the story. 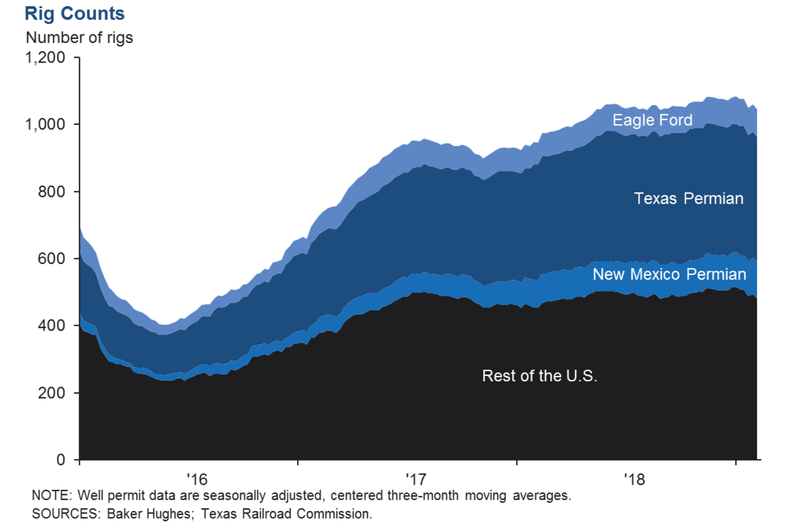 Where it stands: The monthly report released yesterday actually shows a leveling off in the rig count, which is one metric of industry activity, in the Permian and Eagle Ford regions, and declines elsewhere in the U.S.
Earnings: Via Reuters, "French energy major Total said its net adjusted profit rose 10 percent in the final quarter of 2018, lifting its full year earnings by more than a quarter after record oil and gas production." Discoveries: Exxon's mammoth find off Guyana's coast just keeps growing. The company announced 2 more discoveries yesterday in the area where it has found what it estimates are over 5 billion barrels of oil-equivalent. Why it matters: Guyana has emerged as a key part of Exxon's future production plans. They plan to begin producing oil there in 2020 and see output reaching over 750,000 barrels per day by 2025. The Houston Chronicle writes, "The new Tilapia-1 and Haimara-1 well discoveries come in the Turbot area of what's known as the potentially prolific Stabroek Block offshore of Guyana that Exxon Mobil is exploring with its New York-based partner, Hess Corp."
Libya: Via the Wall Street Journal, "A Libyan general has seized the country’s largest oil field, according to officials, cementing control over one of the North African nation’s key economic resources and increasing the likelihood the facility will restart production." Axios' Amy Harder breaks the news that Mandy Gunasekara, who has been instrumental in crafting President Trump’s regulatory rollbacks on a range of air pollution standards, is leaving EPA to start a political advocacy group defending those policies. Driving the news: Gunasekara, deputy assistant administrator in EPA’s air office, is sending her resignation letter to Trump on Friday, according to a copy viewed by Axios. It’s expected to be a nonprofit with a c(4) tax status, which means, among other things, that its donors can be anonymous. The big picture: Gunasekara, who describes herself in the letter as a conservative Mississippian, is one of several Trump administration officials in the environmental space who used to work for Sen. James Inhofe (R.-Okla.). Inhofe has been one of the most outspoken lawmakers who does not acknowledge the scientific consensus that human activity is the main driver of global warming. Last year was Earth's 4th-warmest year on record, coming in behind 2016, the planet's warmest recorded year, as well as 2015 and 2017, according to information released Wednesday by NOAA, NASA and the U.K. Met Office, Axios' Andrew Freedman reports. Why it matters: The yearly rankings don't tell the whole story of long-term climate change, since natural variability can still push or pull an individual year up or down the rankings. However, the overall picture is growing starker with each passing year. At the same time, GHG from the burning of fossil fuels — as well as deforestation and intensive agriculture — have skyrocketed to levels not seen in more than 800,000 years. Per NASA, global temperatures in 2018 were 1.5°F (0.83°C) warmer than the 1951–1980 mean. Analyses from Met and the World Meteorological Organization also ranked 2018 among the top 4 warmest years on record. NOAA says the annual global land and ocean temperature has increased at an average rate of 0.13°F (0.07°C) per decade since 1880. However, this rate has more than doubled, to 0.31°F (0.17°C) per decade, since 1981. Lyft and EVs: Via the Washington Post, "Environmentally conscious Lyft riders will soon be able to summon a hybrid or electric vehicle with the tap of an icon, rejecting the conventional combustion engine as their commuting mode of choice, according to a company announcement Wednesday." GM and profits: "General Motors does not expect its electric vehicles to turn a profit for at least a few more years, CEO Mary Barra told investors Wednesday," CNBC reports. Honda and batteries: Per Electrek, "Honda hasn’t been one of the most active automakers when it comes to electrification, but it is now making some big moves, including securing a battery cell supply contract for about 1 million electric vehicles with [Contemporary Amperex Technology Co.], one of the largest battery manufacturers in the world." Axios Expert Voices contributors Sagatom Sah and David Livingston write that the controversial election of Felix Tshisekedi to the presidency of the Democratic Republic of the Congo (DRC) at the end of last year raises many new questions about the country’s future, especially with respect to the global cobalt market. The big picture: The world’s cobalt supply is inextricably tied to the DRC’s political stability, because the country holds half of all known, economically recoverable cobalt reserves — currently accounting for 60% of global production. Why it matters: Cobalt, which the U.S. considers “vital” to national security and economic prosperity, is an essential component for many large-scale energy storage systems and EV batteries. Where it stands: Cobalt shortages are already expected by the early 2020s because of rapid demand for energy storage technology, which would drive up battery costs unless alternative chemistries are developed. 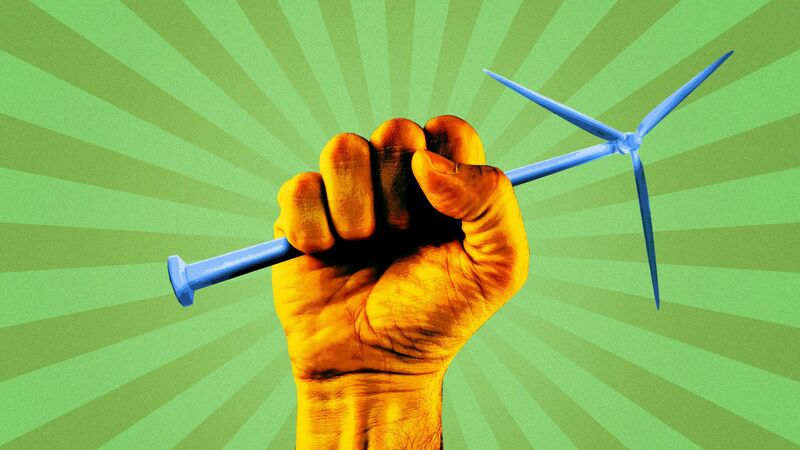 Exacerbating the challenge for the U.S., the Trump administration also imposed tariffs on cobalt as part of its broader trade war with China, the world’s leading producer of refined cobalt and a leading supplier of U.S. cobalt imports. The big question: It’s unclear whether Tshisekedi will now follow through on the decree, abandon it while leaving the new mining law in place, or reform or revoke the law altogether. Though he purportedly criticized the law on the campaign trail as “anti-investment,” Tshisekedi also said in a recent speech that he wants mineral rents to increase from 10% to 45% of total government receipts. Saha is an independent international energy policy analyst. Livingston is deputy director for climate and advanced energy at the Atlantic Council’s Global Energy Center.